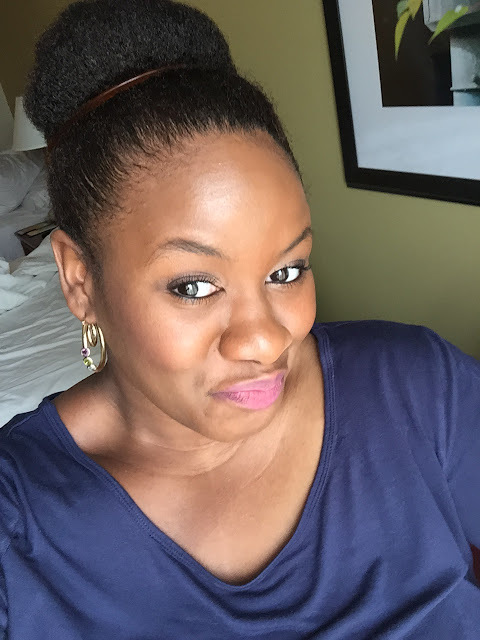 Whether you're out of town on vacation or you've opted for a staycation, you generally want to take a departure from your daily routine. 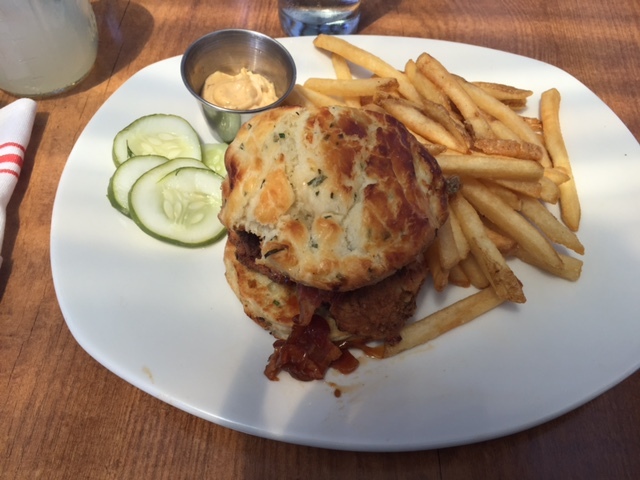 While on vacation I seek out amazing food, beautiful sights, great company and relaxation. 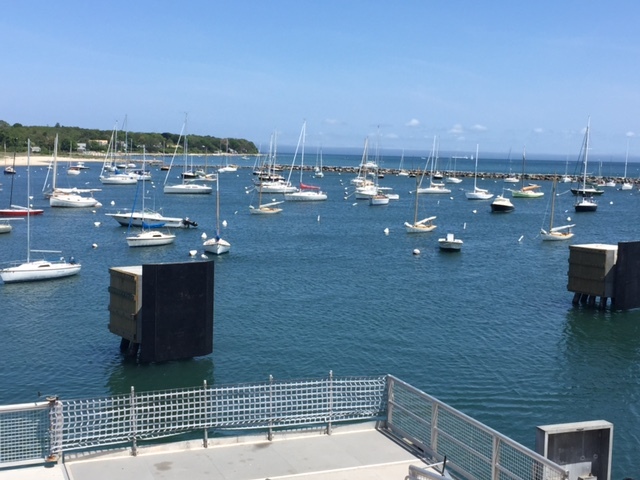 Recently, I enjoyed all of the above as I embarked on a journey that began with the sights and tastes of Rhode Island and ended with breathtaking views in Martha's Vineyard. 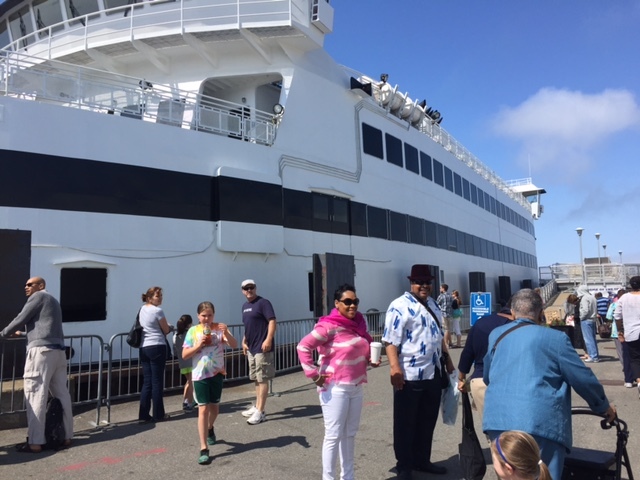 Staying in Rhode Island and taking an unbelievably smooth ferry ride over to Martha's Vineyard may be an opportunity to save a bit of money and enjoy a state that may never have been on your vacation radar. I had never been to Rhode Island prior to this trip, but I wanted to taste their offerings, and taste I did. An area known as Bowen's Wharf is filled with restaurants and there are nearby shops where you can pick up knickknacks. The streets were bubbling with activity as I strolled along looking for a place to eat. My traveling companions and I had heard great things about The Mooring, but it looked so crowded and I knew that the waterfront restaurants would have a larger draw, so we moved along to the spot next door, The Smokehouse . 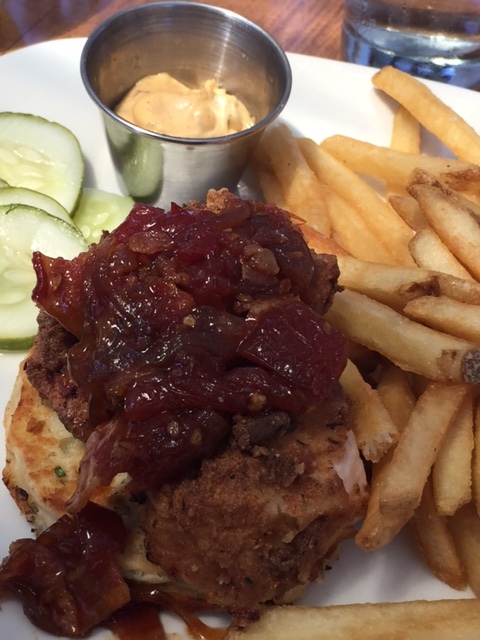 If you order the fried chicken that comes with a red-onion jam, thank me later. The bacon chunks in the jam are big enough to be picked out if you're not a pork eater, but you will want to ensure that the jam is included. A generous portion of jam sits atop perfectly seasoned tender fried chicken, which is placed between a delicate buttery chive laced biscuit. This delicious meal only cost me $12.00 and depending on where you are seated, you can look out on the water. 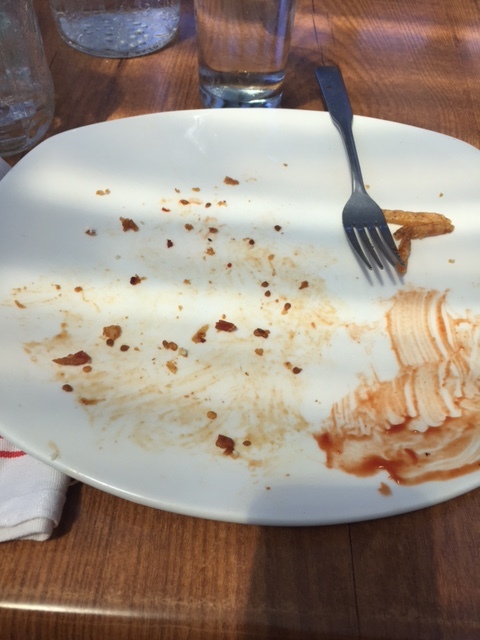 I should have ordered one to go but I was so full and I wanted to save room for other Rhode Island offerings. I would be remiss if I didn't mention the Italian ice that nearly gave me chills. I went to Sprinkles, also in Bowen's Wharf, and I picked up what I thought would be a pretty standard iced treat. After my first taste of the blueberry and cherry goodness I knew I had found one of the best Italian Ices I had ever tasted. After returning to NY I had to find out more about the company and it looks like Sprinkles sells Richie's Italian Ice which does not have a home in my area of NYC....sheds a tear. 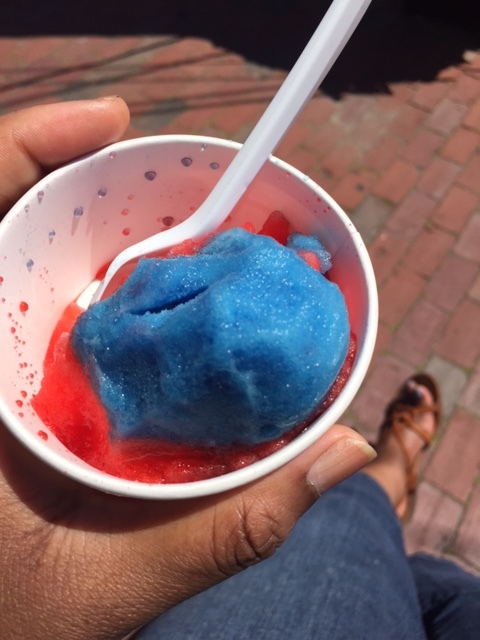 Some Italian ices give you a watery taste combined with a little flavor. Richie's ice was smooth, creamy and packed with flavor. I promise I did more than eat, so let's check out some of the other attractions. 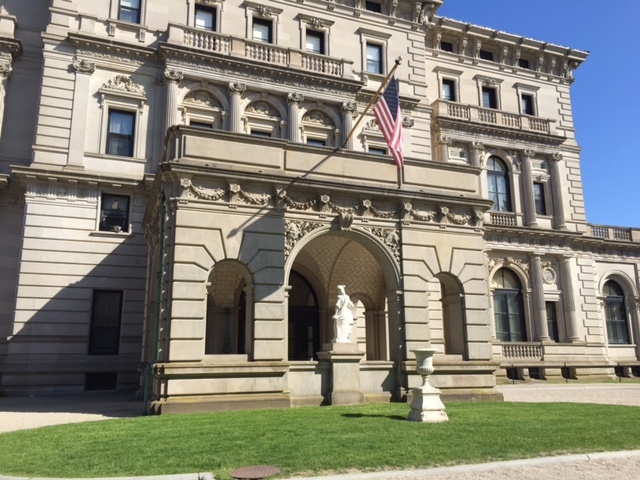 I am not a "museum" person but I did tour The Breaker, a mansion which belongs to the Vanderbilt family. You can move at your own pace on this self guided audio tour if you want to learn more about the family and the ornate decor in their home. You can't take pictures inside, but get your clickers ready once you exit the mansion and tour the grounds outside. 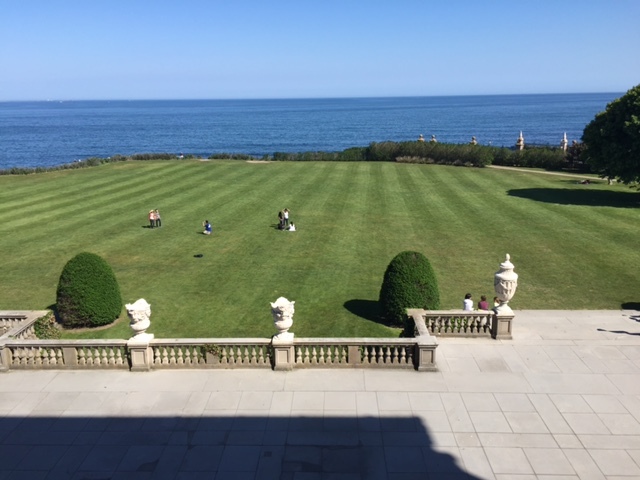 Needless to say there are quite a few reasons why you may want to book your vacation in Rhode Island. Now off to the Vineyard! 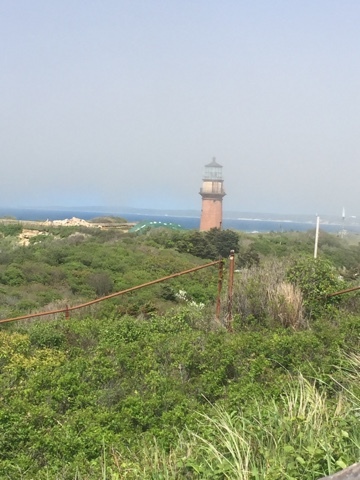 I noticed fog in the distance as we hopped aboard the ferry to Martha's Vineyard, but we passed right through it and had nothing but clear sunny skies to guide us to the island. You can even bring your car aboard the ferry if you plan on driving around your own vehicle on the island. Please check with ferry officials for more details. Once you step foot on Martha's Vineyard don't expect to grab a bite at McDonalds or some other fast food chain because they aren't allowed on the island. Without the existence of such eateries you get to enjoy the Mom and Pop local restaurants that handle their food with more attention and detail. Go ahead and enjoy the local eats! 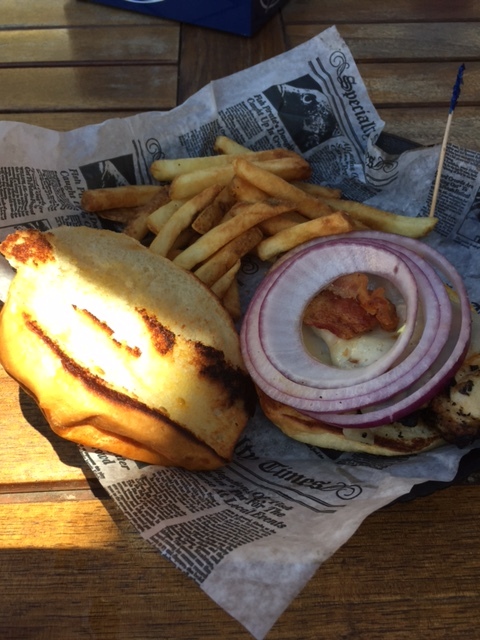 Some members of my group went to Nancy's but I went right next door to a Bar and Grill where I had a bbq chicken sandwich on a brioche bun, it tasted like it had just come off the grill....YUMMY. Fun Fact: If you're looking to wash down your meal with an alcoholic beverage, you can now do so in any of the towns on the Vineyard. So what's the big deal? Previously, Oak Bluffs and Edgartown were the only wet towns on Martha's Vineyard, so your quest for booze could only have led you to those two towns in years past. 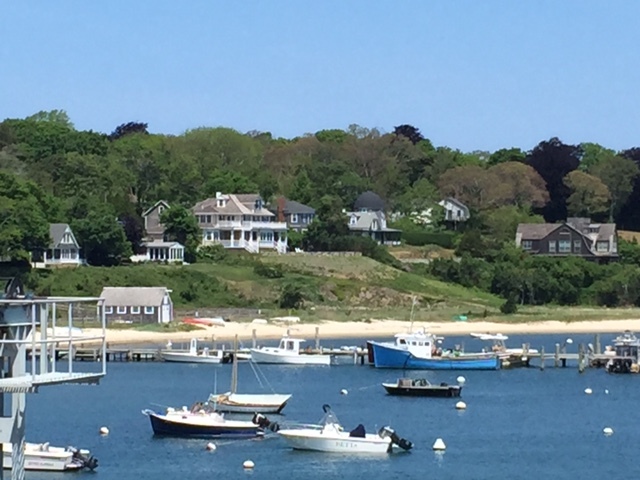 We traveled through the different towns on the Vineyard, but we spent most of our time in Oak Bluffs. 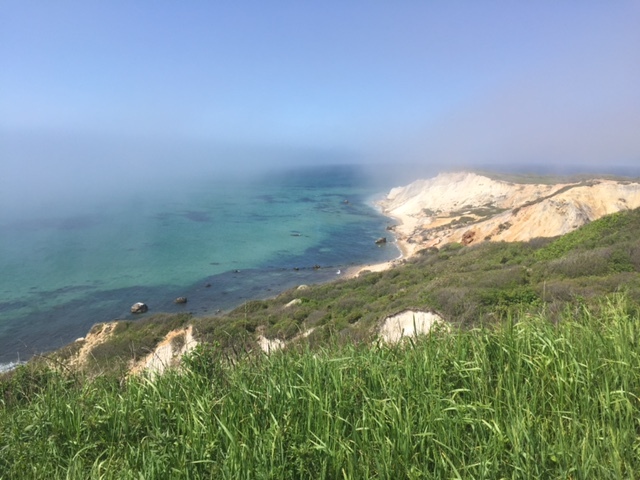 The picture at the start of this post is of the beautiful natural clay cliffs in the town of Aquinnah. It felt like each area of the island had its own story, which only helped to enrich my experience. Over the years many films have used Martha's Vineyard as the backdrop to the story, even if the movie wasn't really filmed on the island. Jaws #1 is probably the most famous film which was actually recorded on the island. 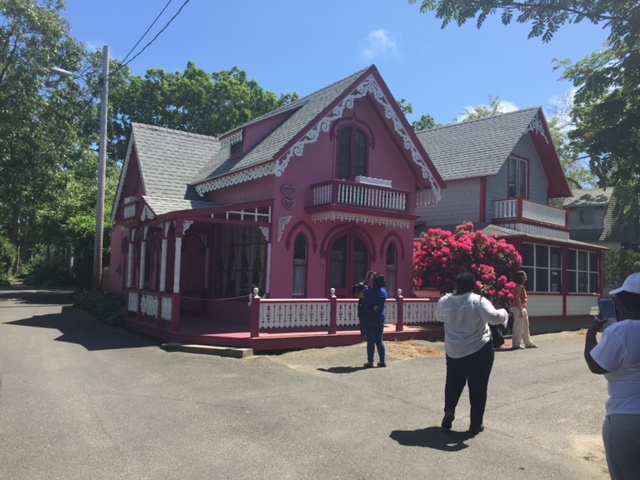 Although flicks like Inkwell and Jumping the Broom were set in Martha's Vineyard, the movies were filmed off of the island. The locals were so friendly, so it made walking around town a very comfortable experience. There are so many things that I could tell you about this trip, but I would love it if you could experience it for yourself. 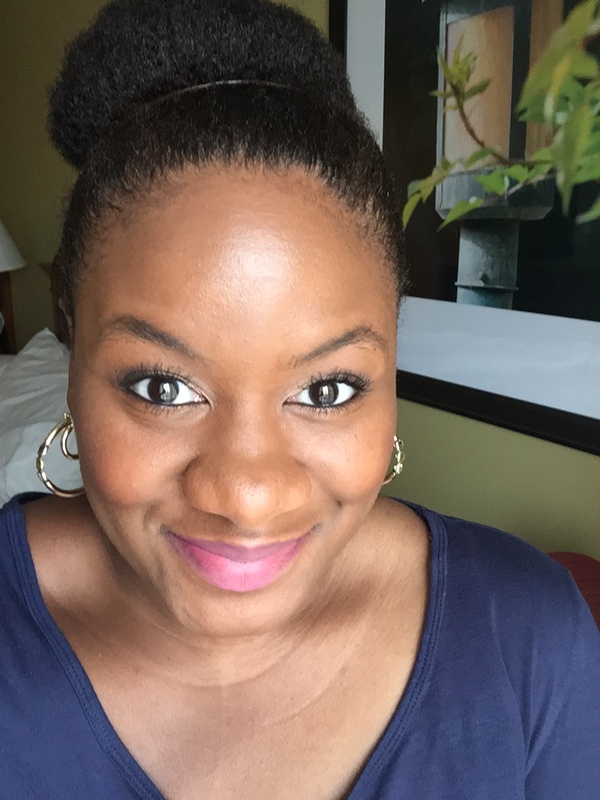 Have you ever been to Martha's Vineyard? No? Well what are you waiting for, start planning your trip.